Shoot ‘Em Up games have a long history: Life Force, Gradius, 1942, and the list goes on. 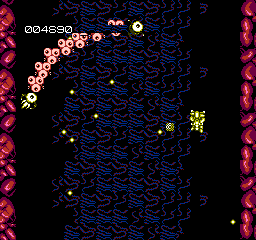 Among the flurry of Shoot ‘Em Ups produced for the NES, Abadox reared its head and joined the barrage. When I noticed that both Milton Bradley and Disney had a hand in this game, however, my head took a sharp tilt. This game is definitely a great shooter, but there’s a question that comes to mind about Abadox: is a game only as good as the sum of its parts? Abadox: The Deadly Inner War (which is the full name of the game, for the record) places you in the spacesuit of Nazal, a soldier in the army of a planet that has been swallowed by a creature called Parasitis. That planet is Abadox. Not only is Abadox inside of this alien, but so is Princess Maria of said planet. What happened to the rest of the royal family? Who cares? A princess needs saving! Traversing six levels, Nazal fights various creepy crawlies and far too organic feeling creatures to rescue the princess from the belly of Parasitis. Using power-ups and swift maneuvering, you must guide him toward his goal. The game is really nothing different than any other game that preceded it. Coming out five years after Gradius, one of the forerunnners of the genre at the time. Where that game revolutionized the genre, Abadox proudly rides its coattails into video game history. While the game is thoroughly enjoyable, the switching from side scrolling to overhead shooting was done when this game came out, the power ups, even the setting seems ripped straight out of those games. The only thing it has going for it is that some of the power-ups are far more enjoyable than those of more ‘straight’ shooters, including a ‘ring’ shot that you can get. Other than that, this really is a greatest hits of other games that came out in the five years before. This game, however, is short and has unlimited continues, which makes it somewhat perfect compared to other more difficult and longer games. With six levels and a moderate difficulty level, this game acts as a starter kit to work up to other games of the time. On a personal note, while I enjoy shooters, I’m not terribly good at them. I didn’t have much of a problem with this one. While you may read about the difficulty of this game, it doesn’t hold up to the ‘hype’. On the technical side, the game has its ducks in a row. Graphically, it’s slightly more cartoon like than its predecessors, lending to the idea that the game is a ‘starter shooter’. Some of the sprites look like they were ripped directly from Life Force and Gradius. It’s almost like Parasitis itself, swallowing other shooters and bring the best parts into itself. While the similarities are staggering, it’s still a clean game on the front end. Visually, looking at the overhead shooting sequences is more enjoyable than the side-scrolling sequences. The music feels like the high point of the game. The music isn’t memorable in the long run, but it enhances the game. While no one track particularly stands out, the overall soundtrack is really good and suits the gameplay. A major plus in the Nintendo world. Despite the fact that this game plays and looks like many others of its ilk, it makes its own presence. It’s easy enough to enjoy Abadox as a whole of its parts, despite picking out pieces and mechanics from other games at an alarming rate. The game is a lot of fun, the plot is really interesting (though like most shooters, doesn’t really matter in the game) and just as zany as any other plot from a Nintendo game. It is an easy game to practice at and progress through without much incident. A major mistake, however, would be to read the instruction manual. It pretty much ruins the entire game. Other than that, this game does stand up to the test of time. It’s fun, manageable, and while it’s not winning any originality points, it’s great to recommend it for those who enjoy the typical arcade shooters or even the more modern ones.